The latest trend in active adult homebuilding focuses highly on energy efficiency. With energy bills seemingly always on the rise, active adult homeowners are constantly looking for ways to cut back on usage and save money. But energy efficiency is much more than simply replacing your traditional incandescent light bulbs with fluorescent ones. From rooftops to windows and the insulation and appliances inside, more and more houses these days are being built as "zero-energy homes." Simply put, a zero-energy home is one that produces as much energy as it uses. It is built to be airtight and well-insulated, while utilizing energy-efficient appliances, heating and lighting, as well as solar photovoltaic (PV) collectors. They look like traditional homes, but do so much more to aid in creating a "green" environment, plus help people save money. The average savings in energy costs per homeowner was $2,200 in 2009, according to the U.S. Department of Energy. Unlike "off-the-grid" houses that don't receive any power from an electric company, zero-energy homes are connected. On sunny days, the solar panels on your roof produce energy; if there is an excess after what your home uses, it's sent to the electric grid and you receive a bill credit. On cloudy days, when you're drawing energy from the grid, that use is subtracted from your credit. So, at the end of one year, your net energy bill (defined as energy credits you receive minus energy usage) will be zero, so all you pay is the monthly hook-up fee to your electric company. In addition to saving money, the benefits of a zero-energy home are plenty. Homes are usually built with low or no volatile compounds (VOCs), so the overall environment is healthy, clean and nontoxic. 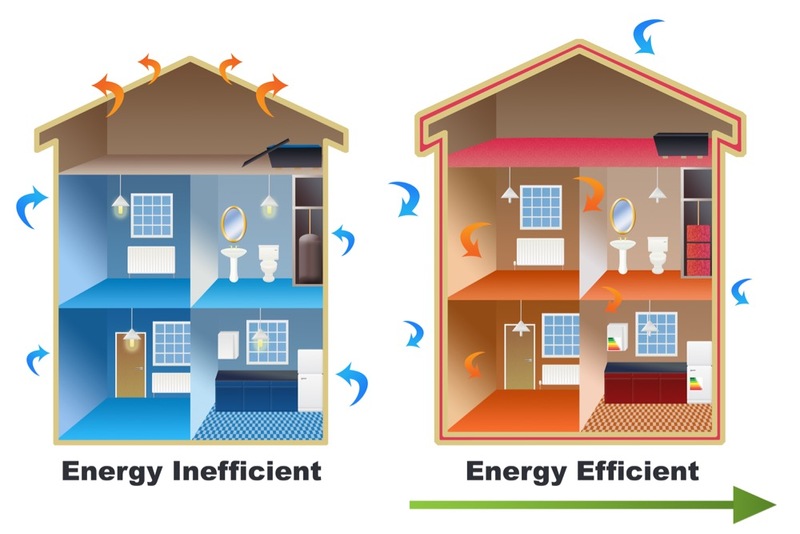 The energy recovery ventilation (ERV) or heat recovery ventilation (HRV) system that is installed not only retains heat in the home, but also filters and cleans the air to reduce pollutants and allergens. In addition, moisture build-up (and oftentimes the accompanying mold problems) are eliminated. Zero-energy homes also have little or no draft and minimal dust, plus there aren't any unhealthy fumes because no natural gas or propane appliances are in the house. Thick walls, triple-paned windows and tight construction make for a quieter home because outside sounds don't penetrate the inside. Heating or cooling is steady and also quiet, and if there is a power outage, a zero-energy home will stay at a comfortable temperature longer than a traditional house. There are more benefits too. A zero-energy home does not produce any carbon emissions because it has zero net energy use. The average home, on the other hand, produces approximately ten metric tons of carbon dioxide from the use of electricity and fossil fuels, according to the CoolClimate Network of U.C. Berkeley. Although zero-energy homes cost more to build than traditional homes (about five to ten percent more, according to ZeroHomes.org) it can be paid off in about five to 15 years, or be included in a mortgage. Plus, state and federal cash incentives and tax credits are often available for solar panels, solar hot water, and energy-efficient appliances and heating systems. Even if a home is not completely zero energy, other steps can be taken to make it green. For instance, if solar panels are not an option due to financial reasons or lack of sunlight, houses can be built with all the energy-efficient features but without the panels (known as Zero Energy Ready Homes or Near Zero Energy Homes). Traditional homes can be remodeled to be zero energy, and in some active adult communities, the trend is to construct more energy-efficient homes simply by using appliances and constructions methods that meet these guidelines. When you consider the benefits of a zero-energy home, not only for its occupants but also for the environment, going green should definitely be an option when building or buying a new 55+ home.